True or False: Drinking water before a meal helps you eat less? | Was Mom Wrong? True or False: Drinking water before a meal helps you eat less? Myth 6 explores whether it is possible to drink too much water when exercising. Myth 14 considers the concept that we should drink 64 ounces of water a day. Myth 39 examines whether we are already dehydrated if we don’t drink water until we start to feel thirsty. Myth 59 investigates if water heated in a microwave can erupt and cause severe burns. So far in this book, we have evaluated if many brands of bottled water are simply tap water (Myth 16) and if you burn more calories by drinking ice water (Myth 17). And there are more water-related topics to come! I’ve previously shared that roughly 65% of us are either overweight or obese, so I’m seldom surprised to hear the many interesting things people do in their attempts to lose weight. The idea that drinking water before eating can promote weight loss has been around for some time, and I’ve heard more than one registered dietitian advise overweight people to try it. But is it true? I was surprised to learn that this topic hasn’t been studied much. However,I did find research conducted by Dennis and colleagues (2010) and published in the journal Obesity. Researchers investigated whether having adults ranging in age from 55–75 drink 16 ounces of water (about two measuring cups full) prior to eating breakfast, lunch and dinner resulted in the consumption of fewer calories. Research participants were already on a low-calorie diet: 1,500 calories per day for men and 1,200 calories per day for women. After three months of following this regimen, the participants who drank 16 ounces of water prior to eating lost, on average, 15.5 pounds compared to an average loss of 11 pounds for participants who drank no water prior to eating. So the water drinkers lost weight at a 44% higher rate than those who didn’t drink water before meals. Other research suggests that drinking water prior to eating is effective in reducing caloric intake for individuals older than 60 who are not on low- calorie diets, but pre-meal water consumption may not have the same effect for folks in the 20–35 age range. The idea that drinking water before meals leads to weight loss triggers my “If it’s too good to be true, it probably is” reaction. But it really does appear to be the case, especially for individuals beyond age 50. What’s the explanation? According to the referenced article, drinking water prior to eating “may aid in increasing fullness, thereby promoting a reduction in meal energy intake.” Drinking water might also help decrease feelings of hunger, which could result in fewer calories consumed during meals. It also is possible that water consumption could replace sugary drinks people sometimes drink with meals, resulting in even lower caloric intake. 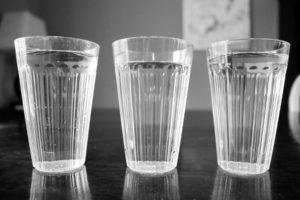 Drinking a couple of glasses of water prior to meals likely won’t lead to pounds of fat magically disappearing, but it does appear to be a reasonable and healthy way to decrease the number of calories we consume. And that calorie reduction is what could have a modest impact on weight-control efforts. Before writing this chapter, I didn’t make it a habit to drink water before meals, but I’m going to start! Dennis, E., Dengo, A., Comber, D., Flack, K., Savla, J., Davy, K., & Davy, B.: Water consumption increases weight loss during a hypocaloric diet intervention in middle-aged and older adults. Obesity (2010), Vol 18, pp. 300-307.